We just released Dashcam Viewer v1.8.7 for Macintosh and Windows. Added the Center checkbox to the Map view. You can toggle this option to have the map auto-center with the vehicle, or unselect it to have the map stay still and the vehicle marker move. Thanks to user Thomas D. for the suggestion. Added new keyboard shortcut: type ‘A’ in the Graph window to autoscale the view. [Windows] Added GPS support for Thinkware F750. Strangely, this dashcam’s MP4s won’t play in the Mac version of DCV, nor in QuickTime Player. The progress bar displayed after loading movies now displays meaningful progress. Improved the focus of the start/stop button in player window. This should make the spacebar start/stop function, and other keyboard shortcuts, more reliable. Fixed recently-introduced bug in which Koonlung K1S dashcam would only show the first channel. Better compatibility with GPS files from MINI dashcams. Fixed bug in keyboard shortcuts for adjusting time offset in the Graph View. We just released Dashcam Viewer v1.8.6 for Macintosh and Windows. 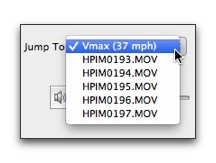 Added new “Jump To” feature to quickly go to the fastest portion of the route or to a specific movie file. Added compatibility with latest DJI Phantom 3 SRT file format. Phantom 3 altitude is now displayed in graph and in Dashboard view. Fixed bug in zooming and translation of videos within movie window frame.